"This medium-sized school located in Springfield, Massachusetts provides "strong professionally-based programs with a solid liberal arts background" to its 2,700 or so undergraduate students, a number of whom are part-time and non-traditional students. Past students have interned at the nearby Basketball Hall of Fame and the Lego Company, among other places." Describe the type of student who should not attend Western New England University and explain why. Western New England University should not be attended by slackers and the people who do not want to work hard because it is an excellent university. Describe the type of student who should attend Western New England University. Why? 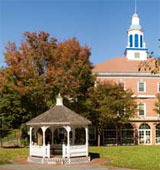 Western New England University is a small private university for the students who are well in academics as well as sports. What is a typical Western New England University student like? Describe the type of person that should attend Western New England University. What are the top 3 reasons someone should attend Western New England University? The top three reason someone should attend Western New England University is the so many different and diverse majors, the small campus size and above all the professor's love for their students' success. What was a typical Western New England University student like in high school? Describe the type of person that should attend Western New England University. This Western New England University website conveys a rich and powerful portrait of a special institution that provides outstanding educational opportunities for all students. July 1, 2011, marks a defining moment for our institution as we proclaim our new status as a university. This historic juncture follows a period of unprecedented growth and the realization of a long-term goal. While our university status accurately reflects the breadth and depth of our academic offerings, we will remain true to our core values as an institution that supports and celebrates the aspirations and achievements of our individual students. Beyond descriptions of the majors and programs found here, the University is as much about the individuals who help students grow and thrive in the educational and social environment of the University. Behind every program and each activity there are faculty, staff, coaches, and administrators who bring life and vitality to all that is undertaken here. This is a University of people. Our strength resides in our rich educational programs as well as in our belief in ourselves to be unique because of our history, traditions, and values, and because of the commitment to students on the part of all of us at this University. To all those who will partake in this remarkable institution that is Western New England University, I extend, as President of the University and on behalf of the University, a special greeting. What are the top 3 things that students do for fun at Western New England University? The top three things that students do for fun at Western New England University is going to the football games, Late Nights, and Free Cookie nights. Campus housing is available for undergraduates. Housing deposit : $400.00. Housing deposit due : May 1. Housing deposit is not refunded if student does not enroll.. Freshman allowed to have car. No pets. The average student pays $29,070 for tuition, fees, and other expenses, after grants and scholarships. Total stated tuition is $30,780, in-state and on-campus, before financial aid. Learn more about financial aid at http://www1.wne.edu/admissions/index.cfm?selection=doc.22. Estimate the net price for you at http://www1.wne.edu/admissions/index.cfm?selection=doc.22. The typical (median) early career salary of Western New England University graduates is $49,900, according to Payscale. Western New England University participates in the NCAA Division III for college athletics. Want more info about Western New England University? Get free advice from education experts and Noodle community members. am in Africa that is Ghana.how can I apply?